Climate and Agriculture in the Southeast | What do tree rings tell us about megadroughts in the Western US? 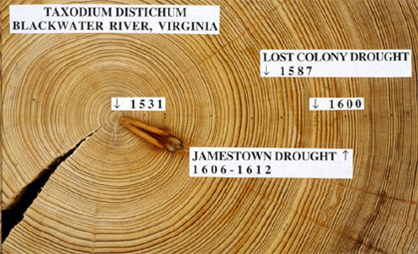 What do tree rings tell us about megadroughts in the Western US? A megadrought is a strong and persistent drought that can last for one, two or three decades. While the US has not seen a real megadrought since climate started being measured here in the 1800’s, tree rings and lake sediments can go back much farther in time and tell a different story. There have been a number of periods in the past 1,000 years when severe drought conditions were the norm in the western US, according to those records. That tells us that megadroughts are a natural part of climate variability, regardless of trends towards a warmer climate in recent decades. But most water managers are probably not prepared for a decades-long drought, and that is of concern because recent warming could make them more likely. Physics Today has an excellent long article about megadroughts and what scientists are learning about them at https://physicstoday.scitation.org/doi/10.1063/PT.3.3997. The story includes some discussion about what happened to previous civilizations when megadroughts hit. If you are interested in seeing how tree rings depict climate in your area, check out this article on the North American Drought Atlas at https://site.extension.uga.edu/climate/2015/11/north-american-drought-atlas/. It allows you to search by grid point across North America and goes back to 400 A.D.
Posted in Climate science, History. Bookmark the permalink.